The exhibition should be re-titled The Age of Acquisitions. Arranged according to how and when the Met acquired these paintings, the exhibition is less about the painters than about the Met and its curators and donors. Which is a huge disappointment to anyone who wants to learn more about the painters and the paintings. The Rembrandt self-portraits excited me much less than before. This time round I was struck by how sensitive the Dutch were in painting portraits of old women. 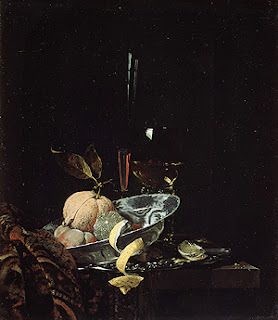 I also liked very much a wonderful still life by Willem Kalf (1619-1693), a painter I discovered for the first time here. It makes me think of the Dutch/Flemish tradition from which Matisse's still life paintings sprang. In her section on vision...she refers to Lorenzo Ghiberti's discussion of optics in his autobiographical treatise, and then concludes that the primacy of sight was "unquestioned" in fifteenth century Florence. Yet one of Ghiberti's most striking remarks concerns the discovery of an antique statue of a hemaphrodite in a drain in Rome: "In this statue were the greatest refinements. The eye perceived nothing if the hand had not found it by touch". No doubt Giovanni Chelleini and his descendants would have thought the same about Donatello's roundel, and would have passed their fingers over it both to appreciate the marvellous variations in texture--and to touch God. Art was cherished and pored over, and not just glanced at on the way to the market, bank or port. pile on top of the bright twisted dump. rocks, and girders klumpety-klump clump. Helvetica is everywhere. Born of post-war idealism, it represented for its creators, disseminators and users rationality, clarity, accessibility, transparency, and accountability. Above all, it was seen as modern; it was the still usable part of modernism. At the same time, the font was seen as neutral. It had no ideological designs on the words, but conveyed the content like clear plastic wrap. I was intrigued by this apparent contradiction between modernity and neutrality, or how one was seen by postwar designers as almost the equivalent of the other. Helvetica, from the Latin word for Switzerland, Helvetia, is a Swiss font. Galen moved to Rome and became a physician at the imperial court. He was the attending physician at a gladiators' school. Jacopo Berengario da Carpi published the first detailed anatomical descriptions of the human body in a series of illustrations. Andreas Vesalius' On the Workings of the Human Body features elaborate and accurate drawing of the dissected human body. This tome marks the beginning of modern anatomy and emphasized the importance of dissection. The painting Anatomy Lesson of Dr. Nicolaes Tulp, by Rembrandt, demonstrates the intimate connection between artists and anatomists. Henry Gray's Anatomy, Descriptive and Surgical is first published. Work on the Visible Human Project began with the goal of creating complete, anatomically detailed, 3-D representations of the normal male and female bodies. until the greying wall breaks. He was born in 1872 to parents of Scottish ancestry at Penola, South Australia. Neilson's father, John Neilson, wrote poetry, and encouraged his son's interest in doing so. His wife, Margaret, was by all accounts warm and loving, but also rigidly Presbyterian and prone to nervousness....the family moved throughout north-west Victoria in search of a better life, but never managed to overcome their poverty as other early settlers had done. Neilson worked with his father clearing scrub, and often composed poems in his head. Are but the wishes of the birds at night. The reptiles and the fishes hungry from the sea. I watched only my second opera yesterday afternoon. Margaret Garner is based on the real story of a runaway slave who killed her daughter to rescue her from slavery. The same story inspired Beloved, by Toni Morrison who wrote the libretto for the opera. Given the torrent of arguments and cataract of topics under consideration, James relies on style to provide the glue for his project, professing his "faith that the unity would come from the style". Now style, as Roland Barthes once argued, amounts to the distillation of the writer's body, the scripted trace of his likes and dislikes as they move from impression to expression. Style is the very index of the writer's sensibility in the old sense of the term. 92nd Street Y just contacted me today to tell me Marie Ponsot has accepted me for her year-long Poetry Thesis Workshop, based on my 6-page manuscript submission. The workshop meets once a week, on Wednesday evenings, in two semesters of eight weeks each. I am really looking forward to working with her and the other workshop participants on my Book of the Body sequence. I have to immerse myself in that sequence again soon. Get into the Body, so to speak. I received a reply from the Headmaster of Raffles Institution to my letter of support for Mr. Otto Fong, a letter which also asked the school to allow the teacher to re-post his open letter on his blog. The background to this, and my first letter, may be read here. I will not quote the reply from Bob Koh, the Headmaster, who signed off as Bob, since it is private correspondence, but I will give the gist of it in order to contextualize my follow-up letter. Mr. Koh's reply was very brief. It thanked me for sharing my views, and reassured me that the school would continue to focus on educating its students. It made no reference to my request for the school to allow Mr. Fong to re-post his letter. I sent a follow-up letter to Mr. Koh today. The school's press statement cited by my letter was published in this New Paper article. from the chapter "The Self: is there such a thing?" I admire Appiah's respect for reason and his understanding of its limits in grappling with the question of what we owe to strangers. If the book gives more arguments against other philosophical positions (such as Postivism, or the concept of cultural patrimony, or the ethical theories of Peter Singer and Peter Unger) than arguments in support of its own, it is partly because such clearing of the ground is necessary before we can see better the complexities of the question. The title of the crucial chapter, "The Primacy of Practice," shows where Appiah's philosophical thinking and sympathies lie. Mr. Otto Fong, a Science Teacher from Raffles Institution, my alma mater, came out as gay in his blog. The school has since gotten him to delete that blog-post, an action supported by Singapore's Ministry of Education. In a statement released on September 10, the Ministry said that it “does not condone any open espousal of homosexual values by teachers in any form, in or out of the classroom” as "teachers are in a unique position of authority and are often seen as role models by their students." You can read Mr. Fong's letter on Fridae as well as Online Citizen. The letter strikes me as courageous and thoughtful, and its posting on the blog a well-considered decision. It comes hot on the heels of Lee Kuan Yew's recent comment (International Herald Tribune, August 24, 2007) that striking down anti-gay laws is "a matter of time." Visited the Museum for the first time on Saturday. It is located behind the Unisphere, a metal globe surrounded by fountains, in Corona Park, Flushing Meadows. Of the works on display in the exhibition, Generation 1.5, I was most excited by the ballpoint pen drawings of the Korean artist, Il Lee. 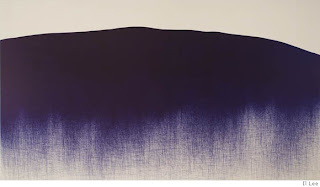 According to this NYT article, Mr. Lee has been making ballpoint pen drawings for 25 years; he began shortly after moving to the United States in the mid-1970s from his native Korea, where he was born in 1952. He went first to Los Angeles then to New York. Of the above painting, “BL-060” (2005), the NYT article says: "[it] is pure graphic intensity. A large, horizontal, heavily inked abstraction, it suggests a mountain range, the ocean, a wide-open landscape and even a rain cloud — nature captured in abstract terms. From some angles you’d swear you could step right into the picture." In a work that moves at times erratically between history, gender studies and psychoanalysis, she asks why the Hindu Right seems so obsessed with the idea of purity - whether the Hindu faith or of Hindu women - and is so vehemently hostile to a Muslim minority that is relatively small, poor and powerless. She sees the Right as having an underlying need to counter the deep divisions within the highly heterogeneous Hindu community by asserting its own militancy and in seeking out Muslims as its irreconcilable opposite. We first saw the wild desolate seascape of Montauk together, in the film "Eternal Sunshine of the Spotless Mind" starring Jim Carrey. From that point we decided we would find a time to visit this fishing town at the eastern end of Long Island. On the Long Island Rail Road train to Montauk, I read Kay Ryan's review of The Notebooks of Robert Frost, edited by Robert Faggen. The review was absorbing, so I did not pay much attention to the towns and villages flashing by.